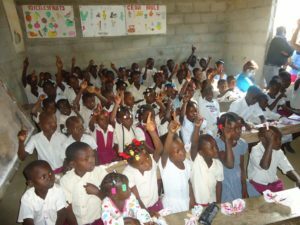 While in Haiti it was not uncommon to share the gospel and have multitudes of people respond to the need for Christ in their lives. This would be most evident with the children but also within the adults where up to 1/3 of the people would commit or recommit themselves to the Lord. First it needs to be realized that salvation is not an emotional or feeling based event. Many time people are looking for a feeling or an emotion to overcome them. Some surveys have shown that 50% of the people who accept Jesus as their Saviour have an emotional feeling or event, they sense God, or feel like weights are removed, they have great joy or peace, etc. and the other 50% feel nothing significant or special, they know they have done what was right, but they just go on with their lives not feeling too much different. However in both of these situations, changes start to take place in the individuals perspectives, their desire to know more about the Lord Jesus Christ, their desire to pray increases, etc. Something started to grow within their spirits. Second God must work to provide a way for us to receive help from Him. Because we cannot have salvation by our own strength John 1:13 explains how we were born into God’s kingdom not by the will of the flesh,(our efforts of strength) nor of the will of man (our own good desires or determination), but of God. Thirdly, Ephesians chapter 1 verse 12 &13 says that from our part we must choose to trust what Jesus has done for us. There are many things that people trust in. They trust that they have prayed the sinners prayer and that that was sufficient. They trust that they have they have been good enough, that they haven’t done too much wrong, that God will be pleased. But the challenge is will, “we simply trust that Jesus will do what He said that He would do”. That He will forgive us, that He will be there with us and that He take us to be with Him. This trusting starts by asking Christ Jesus into your life, and then resting in what He says He will do for you. The fourth step is that God bears witness within us of the reality of the salvation which we have. His Spirit bears witness with our spirit that we are within His Kingdom. What about you, do you know for certain that if you were to die tonight that you would go to heaven? Take some time now to choose to trust in what Jesus Christ has done for you.